Tucker Recreation Center: Named for Tucker Rec Supervisor William Smith, we’ve started William’s Edible Playground. In addition to the blackberry vines and blueberry bushes contributed by Tuckerites Lola Jones and Linda Westra, we’ve planted 20 additional blueberry bushes. This winter, we will plant four apple trees; two in the front and two in the courtyard. We’ll also be adding two or three pawpaws to join the existing pawpaw in the nearby Butterfly Garden. Cofer Park: Across from the swimming pool, local cub and explorer scouts helped plant 20 blueberry bushes on a narrow strip of land. Across the street, persimmon, plum and pawpaw trees encircle the new pollinator garden. Recent additions include blueberry bushes and benches contributed by Tim Francis. About 100 yards behind the pollinator garden, lay “The Peach Pit.” Formerly the site of the Tucker Women’s’ Club, The P Pit is home to 20 peach and nectarine trees- thanks to Tucker High School STEM students who lugged wheelbarrows and buckets of compost and mulch up the hill to help plant and dress the plants. The P Pit includes a wide range of peach species, a nectarine and seedlings found in the Wild. Even though Georgia is the Peach State, peach trees (Prunus persica) are not native. The first ones were imported from Europe in the mid-1500s by French explorers, and originated in China over 2,000 years ago. IF you’ve ever tried, you know peaches are difficult to grow here organically because of a range of pests and diseases – likely from over-domestication that has weakened their natural defenses. The Peach Pit is part of a study investigating the main peach tree diseases, including brown rot and plum curculio. The study is led by FTPOG colleagues, John Heron and Rod Pittman, who are also studying peach trees planted at The Baby Fruit Tree Project in Dunwoody. Plans call for more peach trees to be added, including from heirloom seeds imported from China. A stand of apricot trees will be added next year by Jim Pruckler. A natural amphitheater, we plan to add a gazebo or small stage at the bottom of The Peach Pit for lectures and acoustic concerts, with Tuckerites relaxing on blankets nestled among the peach and apricot trees. Also planned for Cofer: More blueberry bushes near the playground; fig trees beyond the outfield fence on one ball field, and persimmons or pawpaw trees alongside the other; Voila’! Fig Field and Pawpaw Field. Three scuppernong vines rescued from neighbor Guy van Ort’s yard since they were in the way of his plans for a garage addition. Two apple trees also contributed, dug up and moved by van Ort. 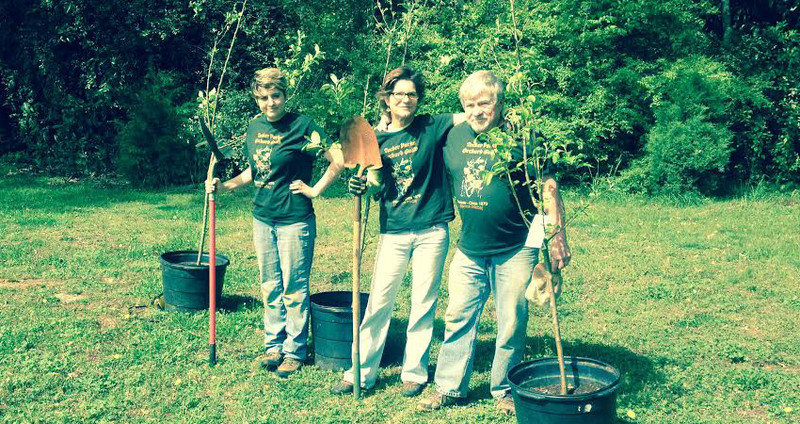 They are becoming the centerpiece of an emerging “Apple Tree Guild.” Fruit tree guilds employ companion planting; one of the fundamental techniques of permaculture gardening. On a plot of land measuring no more than 200 square feet or less, guilds emulate the symbiotic relationships that exist between plants in nature. Two wild plum trees contributed by the Friends of Tucker Parks’ Orchard Guild. Six pawpaw trees contributed by Henderson Park Native Plant and Wildlife Walk Master Gardener project.